An experienced team of divers roots out aquatic weeds one-by-one and dispose of them off-site. Additionally, they will skim off floating weeds, rake the shallows, and leave the whole space clean and ready to enjoy. Without aquatic plants, lakes would have fewer aquatic insects, minnows, and other wildlife. 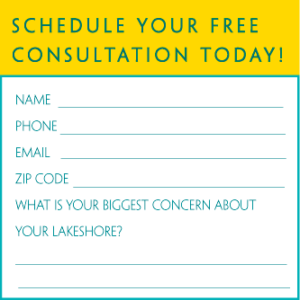 If too many aquatic plants are removed from lakeshores, fish and wildlife populations and water clarity may suffer. You have probably noticed that some lakes are loaded with plants while others have hardly any. The primary factors that influence the growth of aquatic plants are water depth, bottom type, and water clarity. Here are four other factors. Lakes undergo a natural aging process by which, over thousands of years, they slowly fill up with sediment. This sediment is primarily decayed plant and animal matter and eroded soil that has washed in from the surrounding land. The sediment also contains nutrients such as nitrogen and phosphorous. As the sediment builds up, the lake gets shallower, the bottom sediments become more fertile, and conditions in the lake become more favorable for aquatic plant growth. 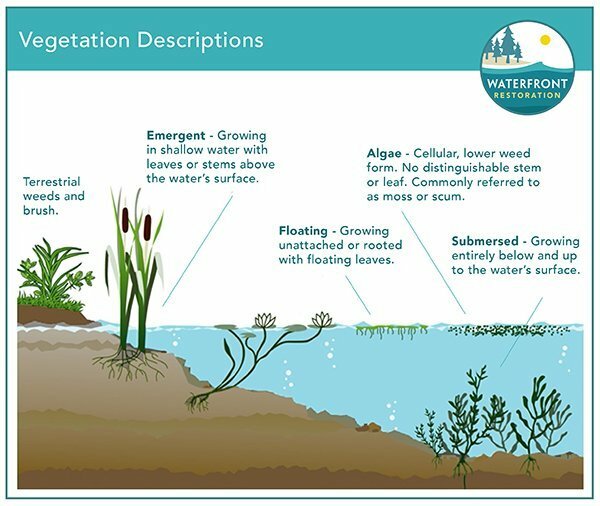 Like land-based plants, aquatic plants need sunlight, water, carbon dioxide, and nutrients-including phosphorous, nitrogen, and potassium to grow. Northern Minnesota lakes typically have few aquatic plants because the watershed is low in phosphorous and nitrogen. In central and southern Minnesota, where the soils are naturally more fertile, more nitrogen and phosphorous enter lakes from the watershed, so these nutrient-rich lakes tend to have more aquatic plants and algae. During periods of heavy rainfall, increased runoff brings more nutrients into a lake. These additional nutrients may be released from flooded soils or carried into the lake on silt or clay particles. Excess nutrients often boost plant growth, particularly algae or free-floating aquatic plants. If rainfall and water levels are normal, nutrient levels and plant growth tend to remain stable. Conversely, low water levels can promote plant growth, particularly that of rooted plants, by expanding the shallow-water areas available for growth. Intense cultivation or land development near a lake can also increase the amount of aquatic plants by increasing the amount of nutrients flowing from the watershed into the water. Nutrient-laden discharges from sewage treatment plants, livestock feedlots, and leaky septic systems promote heavy growth of aquatic plants. Development within a watershed also speeds up the aging process of a lake. The construction of roads and houses removes vegetation that would normally protect soils, leading to more soil erosion. Eroded soils can cover sand and gravel providing additional areas where plants might grow. The addition of houses, paved driveways, and other hard surfaces adds to the amount of nutrient-rich runoff that flows into lakes and streams. For all of these reasons, lakes and ponds that did not support a dense growth of aquatic plants in their natural state may show increased growth because of human activities.